Back in 1971 the first 'serious' loudspeakers that I bought after I left university and joined the BBC were the legendary Acoustic Research AR-7's. I would have bought a pair of the Rogers LS3/5A monitors that were used in the BBC studios, but these were well beyond my budget. The more affordable AR-7s were bookshelf sized speakers with amazingly dense cabinets that produced a bottom end that belied their small size. 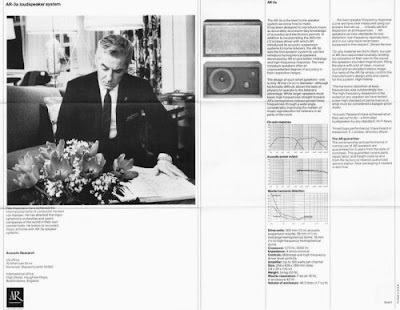 There was a downside however, when compared with the ultra-transparent BBC monitors, the AR paper coned drive units gave the mid range a signature nasal (transatlantic?) twang. But the AR-7s captured the music of that time beautifully, and I nearly wore them out listening to my first Mahler LP, the superb interpretation of the Fourth Symphony by the grossly under-rated Ukrainian born Jascha Horenstein and the London Philharmonic Orchestra. This was produced by John Boyden and released on the budget Classics for Pleasure label decades before Naxos were acclaimed for creating the budget CD market. Horenstein's revelatory Mahler 4, which was recorded when the conductor was 73, remains in the catalogue 37 years later on the same label. I wonder how many Mahler interpretations by todays wunderkind conductors will be in the catalogue in 2045? 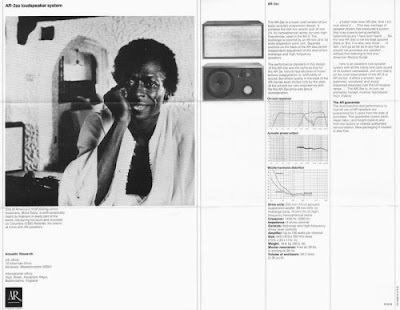 But celebrity culture has its uses, and I must admit my choice of speakers back then was influenced by Acoustic Research's 'cool' advertising with its product endorsements from Herbert von Karajan and Miles Davis seen here. These days dinner party conversations revolve around lossy devices such iPods instead of loudspeaker brands. Does the sound matter anymore? See the art of Miles Davis here. Does sound matter anymore? Of course not. It’s too expensive a proposition for most people to consider. And the major record companies (those that are left) know that, with the definite exception of the one’s specializing in Classical and Jazz. It is interesting that we now have a generation of sound engineers who grew up with poor sound quality and reproduction and use that as their base of operation. I mourn the disappearance of the corner stereo shop, carrying a dizzy array of turntables, tape decks, amplifiers, pre-amps, speakers, and yes, CD players. Now the gadgets are all game-focused (a market area that has greatly impacted CD and DVD sales), and cheaper sound systems, though prolific in the number of speakers for that surround sound feel, are further deteriorating the aural experience. Speaking of AR’s, they combined forces with Deutche Grammophon in the early 70’s to release a 6-LP series of music by American composers. One of my favourite works was Milton Babbitt’s Philomel. It would really be nice to see these recordings reissued. "Does the sound matter anymore?" I trust the question is rhetorical, for if not, the answer is crystal clear: in a word, No. Just a quick note. Before you were down on the DG Webshop, and it's true that the product there were all mp3. But now they are releasing lots of old stuff and virtually all the new stuff on FLAC, a lossless format that is bit-for-bit accurate with the physical CD release. I've downloaded the Mravinsky Tchaikovsky -- WOW! -- and the just released a couple of days ago 8 CD set of Boulez Conducts Bartok. Double WOW! The sound is wonderful. BTW, am I alone in developing tinitus if I listen to MP3s for any length of time??? No problems with FLAC. Heather Harper is another forgotten musician. Does any compression/sound loss occur when you are directly copying a CD via an iMac onto an iPod? After all, all you are doing is copying a file from a “floppy disc” as it were, and storing it on a different “hard drive”. David, it depends on the resolution option you choose when setting up iTunes. In my case I chose a lower resolution for the audio file to reduce the memory overhead and allow more CDs to be stored. This means there is a small but audible degradation between iPod and portable CD player when the same CD is listened to using the same headphones. A.C. Douglas wrote - BTW, my first "serious" speakers way back in the '60s were Peter Walker's original Quad ESLs, and my last (in the '80s) were the Quad ESL63s with a custom designed sub-woofer as part of the acoustic circuit. So it seems you went Yank while I went Brit. ACD, there are very good explanations as to why the sound does not matter anymore. US owned Acoustic Research went into liquidation in 2004. Quad is now owned by the Chinese conglomerate IAG, whose other interests include yacht building. My main speakers are now Bowers & Wilkins 830Ds. At least B & W are still British based. Pliable wrote: Quad is now owned by the Chinese conglomerate IAG, whose other interests include yacht building. Oh dear. How very...sad. Feels like the passing of an old and dear friend. Must have broken Ross's heart to sell out to IAG. When I was a student, our prize possessions were hi fi. Not a car. Not a computer. It really was hi fi in some cases. What is often sold as hi fi now would have made us laugh. Absolutely David, you are in danger of sending me down a path about my Pioneer PL-12D turntable, Cambridge Audio P50 amplifier and KEF104AB speakers. Those certainly were the days.